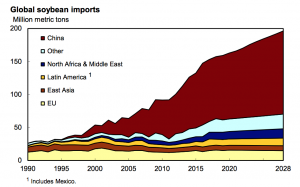 On Wednesday, the U.S. Department of Agriculture released its 10-year projections for the food and agricultural sector. 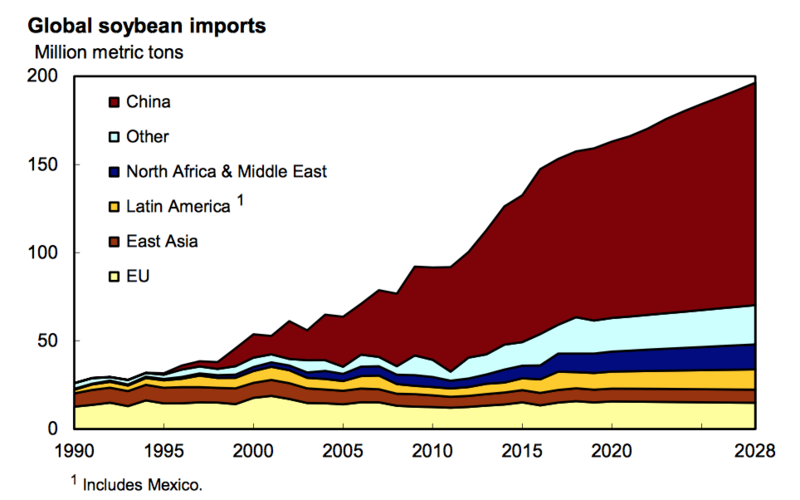 The report noted that, “Over the next several years, the agricultural sector will continue to adjust to the ongoing China-U.S. trade dispute (which is assumed to last the duration of the projection period). This results in an expected shift away from soybean production in the U.S. due to lower prices and towards corn and wheat which are expected to generate relatively higher returns.” Today’s update highlights aspects of the report that focused on corn and soybeans. 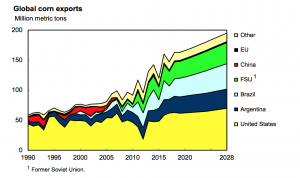 USDA Agricultural Projections to 2028. 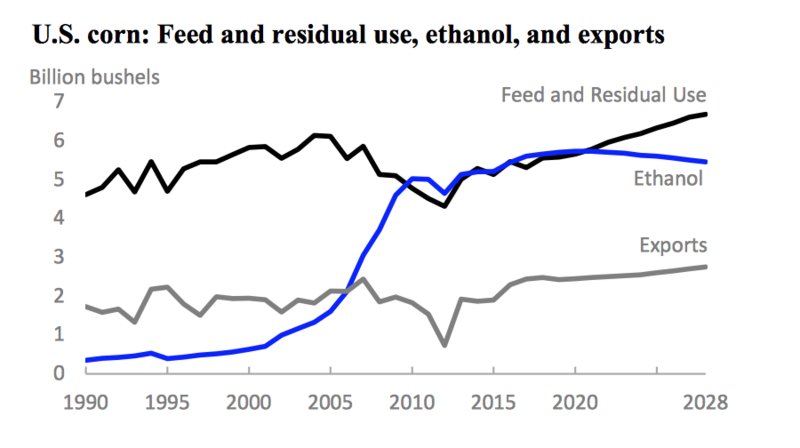 Office of the Chief Economist, World Agricultural Outlook Board, U.S. Department of Agriculture. (March 13, 2019). 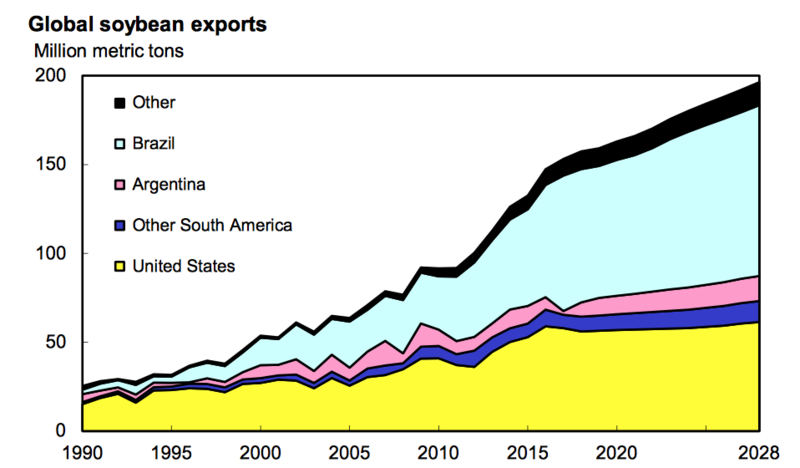 “Strong export competition leads to a reduction of the U.S. share of world corn exports (from 38 to 36 percent) over the projection period; the past 7-year average is 38 percent, well below the 59-percent share for the 2001/02 to 2010/11 period.” (USDA Agricultural Projections to 2028. Office of the Chief Economist, World Agricultural Outlook Board, U.S. Department of Agriculture. (March 13, 2019)). 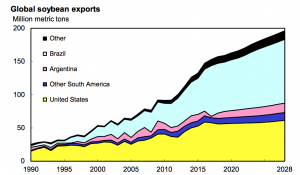 “The three leading soybean exporters—the United States, Brazil, and Argentina—are projected to account for about 87.7 percent of world soybean trade over the next decade.” (USDA Agricultural Projections to 2028. 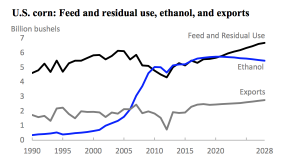 Office of the Chief Economist, World Agricultural Outlook Board, U.S. Department of Agriculture. (March 13, 2019)).